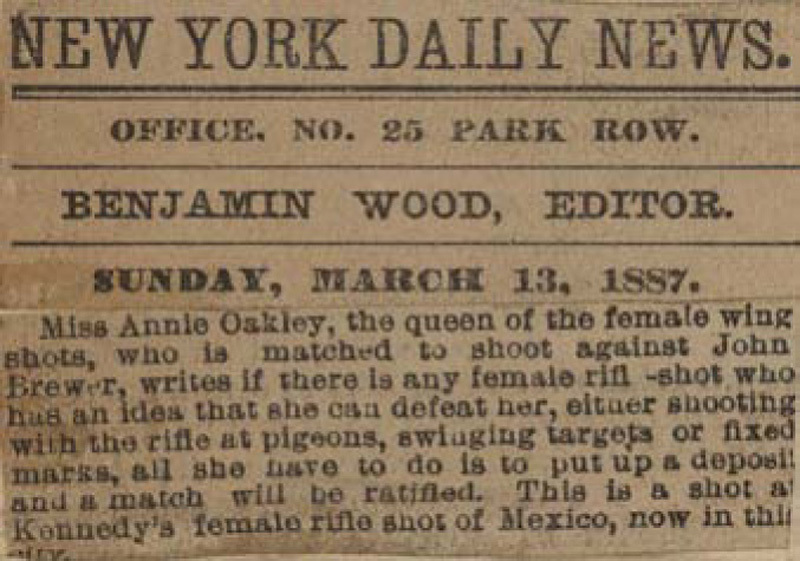 Miss Annie Oakley, the queen of the female wing shots, who is matched to shoot against John Brewer, writes if there is any female rifl [e] -shot who has an idea that she can defeat her, either shooting with the rifle at pigeons, swinging targets or fixed marks, all she have to do is to put up a deposit and a match will be ratified. 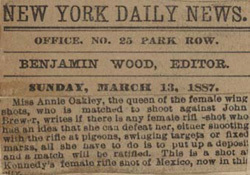 This is a shot at Kennedy's female rifle shot of Mexico, now in this city. Keywords: Firearms. New York (N.Y.). Oakley, Annie, 1860-1926. Rifles. Sharpshooters. Shooting contests. Targets (Shooting). Traveling exhibitions.